When Jim Lathrop took over the family business in 1994, he placed portraits of the four genera-tions that preceded him on the office wall (see detail photos, right). 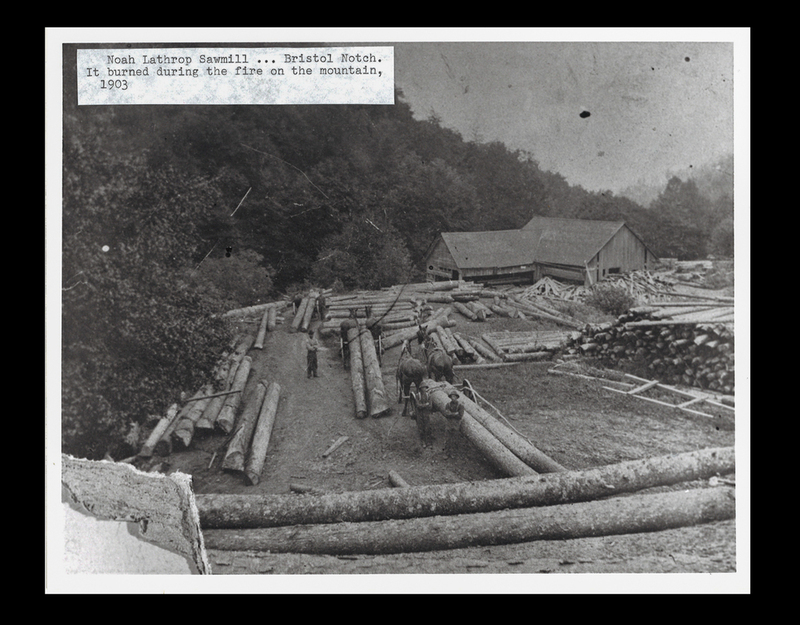 Noah (1848-1931) buys spruce-thick land in Bristol Notch in 1880, builds a water-powered mill, works the woods with oxen, and creates a very profitable niche by selling beams, framing, and fixtures for turnkey barns. William (1877-1958) a genius at setting up mills and then, restless, selling them and moving on to start another. Clarence (1899-1980) a part-time farmer with a portable sawmill. Like William he had a tinkerer’s knack and like Noah the entrepreneurial bent to expand the business. Claire (1922-1999) buys the portable mill from his father in 1944 for $3,500 and later begins sawing year round. With the help of his father, he builds a permanent mill in Bristol and expands it to be one of the largest mills in the state. Jim (1948-) takes over the business using his engineering background to create a state-of-the-art mill. 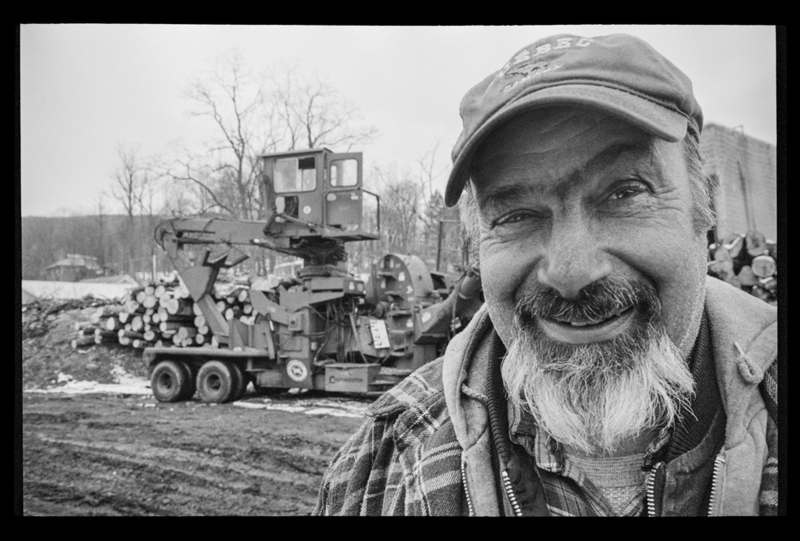 After a fire in 2003, he transitions from saw logs to a chipping operation that is now the largest in the state. Jason (1972-) and Justin (1974-) who took over in 2014 are not yet on the wall. Jim’s advice, “Always have a Plan B.” Detail photos from left to right: Shot of Clarence, sawing in the mill behind his farm, 1940, Aerial shot of mill in 1987, Jim Lathrop portrait, Justin and Jason, Three sequence shot: A high-volume chipping operation is capital intensive, requiring grapple skidders, slashers, chippers and a fleet of trailer trucks. Photos of Lathrop generations courtesy of Tom Lathrop. 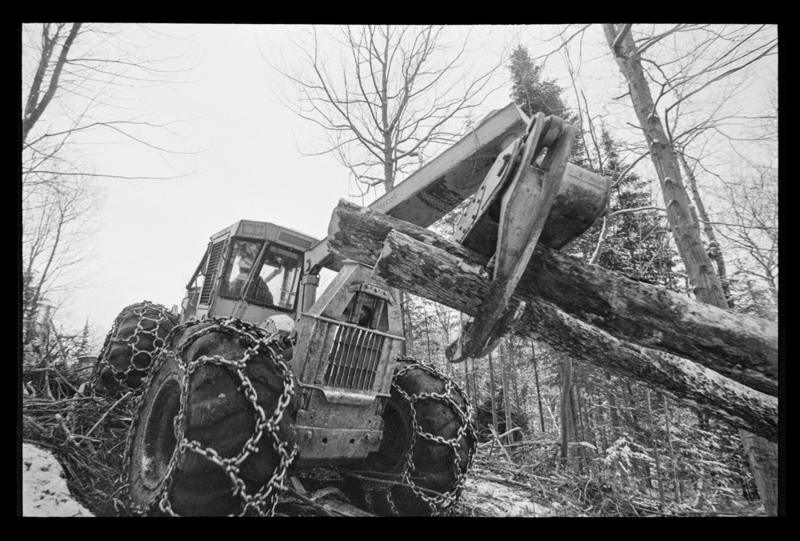 What it comes down to is in logging, just like dairy farming, you have to get bigger and mechanize in order to survive. There will always be a place for a guy who can cut 5-10-15 trees and do jobs that are too small to justify the expense of moving a lot of big equipment. But those little guys don’t cut enough to keep big mills going. I started like everyone else with a bulldozer and a chainsaw. That led to a newer bulldozer and a skidder and that skidder led to another skidder. And then I wound up with a log truck. One bulldozer led to three bulldozers. Two skidders led to four skidders. You pay your dues and work your way up. The only way you could start today and be a chipping operation like us is to have very deep pockets. Machinery is so expensive that if you buy top shelf, you won’t be able to make the payments. And you can’t just buy one piece because you need four or five pieces with it. We used to have a global business with our sawmill, but it’s all local today. We cut our wood within 50 miles of Bristol and stay under 70 miles for delivery. Going east and west is very difficult because of the mountains. Transportation eats up all your profit and you have nothing left if you truck it any farther.